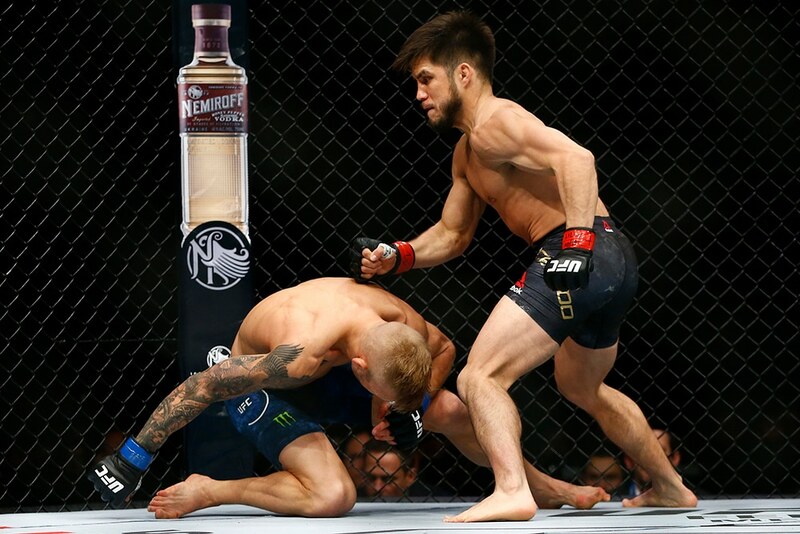 In what I think most people were completely surprised with, the first UFC of 2019 was a shocker, having TJ Dillashaw getting finished in just 30 seconds of the first round against Henry Cejudo. TJ was really upset with the stoppage, going as far in the press conference to say he didn’t lose, and wants an immediate rematch at 125lbs against Henry. Henry countered that he would give a rematch, but at 135lbs for TJ’s title. The second and final knock down of the fight. These two clips are pretty much the whole fight (missing about 5 seconds in the beginning). As you can see, TJ was completed dominated from start to finish. But he was never completely out, and he was trying to scramble as the referee stopped it. Do I think it would make a difference if they let the match go on? No. TJ got dropped twice in less than 30 seconds and was being swarmed by a fresh Henry dropping bombs. I believe it would have been more damage that TJ would have received. BUT, TJ deserved the chance to try and prove us wrong. As a competitor, I have signed up to fight to the death. I have been put to sleep trying to escape a choke, and have had joints snap, crackle, and pop. We aren’t playing tag football – this is a battle for life and death in my eyes (and I know many top fighters see it the same way). I understand the referees obligation is to the safety of the fighters, but within reason. In a title fight, there is usually a lot more leeway given to a champion to survive an onslaught, specially when he is moving around and trying to make something happen. Whether or not he would have survived is irrelevant. The fighters come in to the cage to fight. They know they risk their health and even their life doing so. I know some people think that is an extreme position, but chances are you not competing at that level or have that intense of a devotion that elite competitors have. We have seen some extreme reversals in fights where someone who looked deserving of a stoppage was allowed to continue and came back to win the fight. Every fighter deserves that opportunity. A stoppage should be used for an unconscious fighter, a fighter who is not defending himself intelligently, or a fighter that who is receiving damage without trying to improve their position. But when a fighter is moving, rolling, pushing, and trying to claw his way out of danger – that isn’t the time to stop the fight. If this were a not a championship, but a main event would it be ok to stop it? How about a ufc undercard match? How about a main event for a local show? An undercard match on a local show? How about a couple of rookies? I’ll give you my two cents when you answer. I think for professionals, let it keep going. Fighters know the danger going in and can tap out. If not them, their coaches can also tap for them. For amateur fighters, I understand stopping early. I agree with you David, regardless of whether TJ would’ve been able to recover from the onslaught; these guys train too hard (not to mention all the controversy/disappointment from the fans, etc) to not have a definitive outcome. When we compete we know what the calculated risks entail. There are inherent risks of injury in any form of rigorous physical activity. I don’t think it would’ve taken much longer to have attained a definitive answer. However, if he is still moving and making the effort to better the situation/his position/etc, then let it go just long enough to know decisively whether or not the fight needs to come to an end (e.g. fighter is not moving, blocking, is unconscious, is tapping, etc). I give props to the refs, not an easy role by any means, but you’re right there–you can stop it at any moment you choose; how many times have we seen fighters come back from what looks like the point of no return? Even TJ said he’d ‘rather have been beat, than the fight taken’ from him, let it be more definitive so that there’s nothing to debate. Rules for stoppage should not vary between fights the criteria for stoppage should always be the same. The whole idea of a fight to the death makes little sense, the guy was not defending himself, let alone intelligently defending himself, he got caught and lost. If he thinks he can do better do the rematch and prove he can win don’t expect to die and let everyone else suffer the consequences because he wants to pull an amazing come from behind. Last thing sport needs is a bunch of deaths because people fighting wrecklessly and claiming early stoppage…and death not worst outcome, brain damage is no joke. I disagree with your notion that he wasn’t intelligently defending himself. He was wrestling and try to scramble for his legs. That is an intelligent way to recover. It would be one thing if he was curled up in the fetal position covering up, for sure stop that. But when the fighter is trying to advance his position and was never unconscious, that is an early stoppage in my book. Think about what you are saying, David. “if he dies, he dies.” If he dies, every fighter could be out of business if the sport gets banned. One thing would happen for sure … referee’s would not make the same mistake again. If Referee Avellan let the fight continue and Dillashaw died, all referees would be stopping fights, just like Kevin MacDonald did in this one, so that they would not be criticized for letting it go on to long like Referee Avellan did. Letting it go on only works until someone dies and then referees will be back to erring on the side of caution again. Why bother to allow one death if you are going to end up in the same quick stoppage situation? As it is, there will be a big money rematch and maybe Dillashaw will be more careful next time. The sport wouldn’t be banned if someone dies, but it would definitely be under scrutiny. There is also a major gap between getting knocked out and dying. To be clear, TJ was never unconscious. He was dazed several times but he was still wrestling and intelligently defending himself – which is supposed to be the standard for letting a fight continue. Fighter’s don’t step in the cage to be safe. Quite the opposite – they go to challenge themselves knowing they put themselves at great risk. You equating my position is letting him die is a massive exaggeration. I’m referring to this particular stoppage, where TJ was still conscious and still fighting for a take down. To say that letting it go a little longer would equate to his certain death is a massive exaggeration.